A $50,000 (£25,000) competition has been launched to find the best way to tag a 400m-wide asteroid. 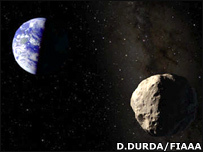 The Apophis space rock is set to make a close pass of Earth in 2029 and scientists would like to confirm that it poses no danger to our world. The Planetary Society will give a prize to the designers of a mission that would allow the huge asteroid's orbit to be tracked with the most precision. The competition has support from the US and European space agencies. "The threat of a strike from asteroids is always a very low probability at any given time, and yet bad things will happen," said the Planetary Society's director of projects, Bruce Betts. "We need to know whether Earth's name is on it," he told BBC News. Apophis will come closer to Earth in 2029 than the orbits of many communications satellites - but it will not hit the planet, that is clear. The concern centres on the small chance that its orbit could be perturbed enough in the flyby to put the rock on a collision path for its return in 2036. Further investigations with ground telescopes are expected to show beyond doubt that this will not happen and that Apophis represents zero risk. And the Planetary Society thinks an innovative tracking mission could make doubly sure. Hence, the prize for an individual or team that can put together the best concept for tagging a huge lump of rock. "You could use a beacon; you could put a reflector on it that you ping; you could put a spacecraft in orbit and track that. There are any number of possibilities and ones we haven't thought of, I'm sure," said Betts. The Society is organising the competition in cooperation with the European Space Agency (Esa), the US space agency (Nasa), the Association of Space Explorers (ASE), the American Institute of Aeronautics and Astronautics (AIAA), and the Universities Space Research Association (USRA). The winning entry or entries will be submitted to space agencies to see if they want to carry the ideas through. Already they are considering a number of concept missions that would assess the best way to deflect or destroy dangerous space rocks. The Planetary Society competition was launched here at the American Geophysical Union Fall Meeting.